Like it or not, Yelp is here to stay. Many insurance agents like this ratings and review site, while others tend to stay clear. In spite of your preference, you can definitely make Yelp advertising and marketing work for your insurance agency. In the competitive realm of insurance marketing, Yelp can help you get more qualified leads and increase your book of business. Let’s try to answer those questions in this blog post. While many people use Yelp to search for their next meal or vacation spot, they also use it when searching for various types of insurance policies. Exactly how many industry related search queries does Yelp boast? 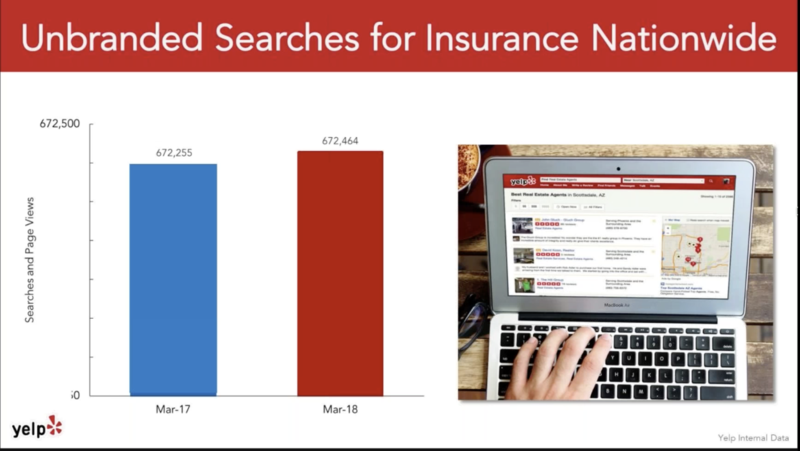 Well, there are over 600,000 searches for insurance on Yelp every month (and growing). It’s one thing to choose a restaurant for your son’s, or daughter’s, graduation dinner. It’s quite another thing to choose your insurance agent, using Yelp, right? Conventional wisdom may tell you that people won’t make financial decisions based on what they read from a ratings website. 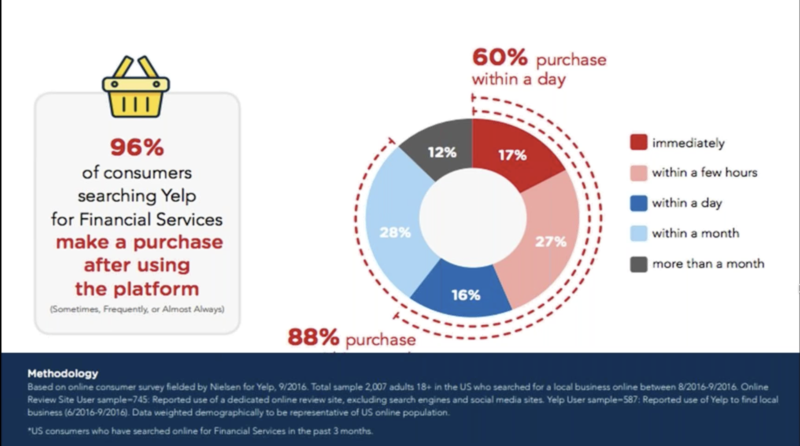 A study conducted by research giant Nielsen found that 96% of consumers, browsing Yelp for financial services products, actually did make a purchase. And even more surprising? About 60% of them made it within the same day. If you haven’t heart, mobile is the future. Since 2015, searches on mobile devices have outnumbered that of desktops. More and more people are using their smartphones and tablets to do their searches. In fact, Google has been telling webmasters, for some time now, to ensure that their website pages render accurately and quickly on all mobile devices. It’s called, “The Mobile First” project. As a result of this Google initiative, mobile sites are more valuable than ever. Successful, digital marketing requires a strong understanding of the shift that is currently taking place, online–everything is going to mobile and local. That’s part of the reason why Yelp is growing at a strong pace. Yelp knows that over 79% of their search queries come from mobile devices, and 65% of new Yelp reviews come from mobile devices. That’s why they’ve optimized all their pages for smartphones and tablets. Plus, they also have about 30 million downloads of the mobile Yelp app. While many more still use their browsers, that’s a whole lot of potential customers that could be going to your agency’s Yelp business page. So, now that you understand why it’s important to improve your presence on Yelp, what are the most important areas of opportunity to explore first? If you haven’t already done so, you should claim your business Yelp page. It’s very easy, and it should be the very first step you take. Targeted ads, or targeted local advertising, refers to ads that show up when people search for particular services, locally. In more practical terms, this is when people type in “insurance in x city” and Yelp displays relevant ads on top of the actual search results. This is similar to the way Google, Bing and Amazon search ads work. This is an excellent way to get in front of your customers when they do a search, on Yelp, within that 10-25 mile radius around your physical office. Another way you can utilize targeted ads is to have them show up on the profile page of a competitor. Even though someone is looking at another agent’s profile, your ad can still appear on that particular competitor’s page, especially if the other agent hasn’t purchased an “Enhanced Profile” listing from Yelp, which prevents competitors from executing on this strategy. . This feature of Yelp is a paid item. While everyone can have a free Yelp profile, an enhanced profile does so much more. An enhanced profile makes you look as good as possible to users. You can have your own branded slide show, showing up to 99 photos in any order you want. Another feature that you can use to your advantage is to host videos on your profile. You can also block competitors’ ads from showing up on your page. This feature is very useful, especially in more competitive markets. Another reason to have an enhanced profile is the customized call to action button right on your page. When people click on this button, they can either go to your website if they are on a desktop computer or call your office directly to make an appointment, if they happen to be on their mobile device. Finally, a completed enhanced profile can actually boost your organic rankings. Yelp wants to display the most useful information to their users at any given time. The more information your profile has, the more likely Yelp will show it to people, which in turn increases your visibility and subsequently the amount of policies your agency will be able to write. Of course, none of these features are useful if you can’t measure your results. That is why insurance agents, who invest in Yelp paid marketing, get a comprehensive monthly, analytics report for their page. It includes inbound traffic from both organic and paid marketing. Plus you get secondary actions on your page, whether that’s consumers clicking through to your profile or actually calling you to book an appointment. These reports will help you accurately calculate your ROI. This simply means adding your business hours, phone number, address, and any business details that people may want to know about your insurance agency. The Specialties section can accommodate 3500 words of text. This is your place to shine! You can put in information about your agency that people may want to know. You can also use this area to add keywords to help people find your office phone number and address. For example, you may want to add additional keywords like, “Auto Insurance, Car Insurance, Homeowners Insurance, Home Insurance, Life Insurance, Commercial Insurance, Business Insurance, etc., into this section. It will help your agency’s Yelp business page get served up more frequently in your market. Here’s another example. Let’s say your insurance agency specializes in food truck insurance. You can use this space to add the keywords, “food truck insurance, so that when someone types this into the Yelp search box, you’ve just increased the probability that your profile will be served up to them. The inbox is the place where messages from users go. People can use this to request a quote or message you directly. You can choose to have the messages forwarded to your email inbox (or that of someone on your team). You can add up to two email addresses to which you can have these messages sent. However, keep in mind that response time to Yelp’s community is quite important. Yelp highlights pages that respond in a timely manner. In fact, when a profile shows up on a search, response times are mentioned; however you’ll be highlighted in green if your team responds in 50 minutes or less. Yelp uses the “median response” time over the past 30-days, excluding those that just popped into your inbox. Have you downloaded the “Yelp App for Business?” If not, please do so immediately, because this is an excellent way to ensure you give Yelp users the best possible service, all the way around. Those clients, of ABS, that are using the Yelp App for business are seeing better, overall results from their Yelp marketing program. Go ahead and add some photos on your profile. You can upload photos of office, your logo, team members, vacations, community activities that you support, etc. Photos can help boost your organic rankings. Photos can also help you get served up in voice search. If you’re still unsure of whether Yelp Ads are right for your insurance agency, think about this: Yelp powers searches for Amazon, Apple and Bing. While these companies are huge entities, they all know that Yelp is the leader when it comes to ratings and reviews (More than 150 million and counting). That means if your potential customers use Bing Local to search for reviews, the top results will be for Yelp. The same goes for Apple Maps. In fact, many Google search results are displaying businesses with strong Yelp ratings. But it’s not just mapping services that use Yelp. Many “voice search engines” use Yelp, also. Over 40 percent of adults use voice search. By 2020, ComScore estimates that this number will increase to 50+ percent. With the gaining popularity of voice technology like Google’s “Assistant,” Google’s “Home,” Amazon’s Alexa and Apple’s Siri, optimizing for voice has never been more important. And with Yelp powering the results to many of Apple’s and Amazon’s search queries, having your business page ready and optimized will go a long way to helping you dominate that 10-15 mile radius around your physical office. Some insurance agency owners may be wary of negative reviews. 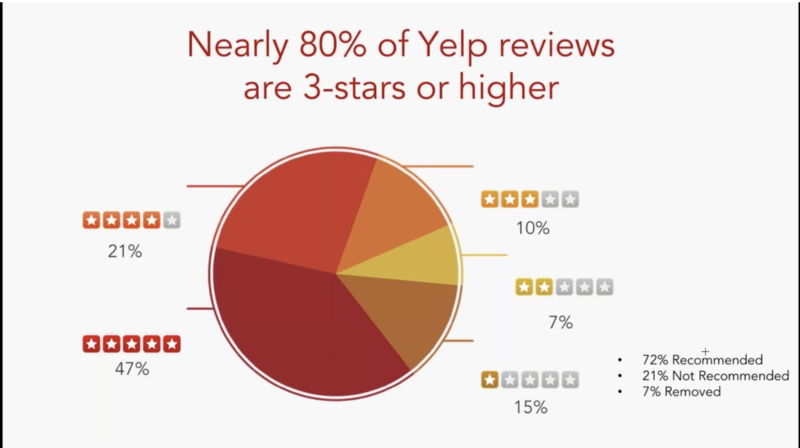 The truth is, nearly 80% of Yelp reviews are three stars or more. Yelp also ensures that only high quality reviews from trusted sources make it to the top of a page, which is why they often hide unhelpful reviews. There are also ways to flag abusive reviews. For example, if you get a review from a competitor or a random person you have never done business with, you can flag this review; someone from Yelp will actually review your case and determine if it’s legitimate or not. Should they find a review to be dishonest or in violation of their content guidelines, they can remove that review. Ready to Take On Yelp Advertising? Now that you know why and how you can use Yelp Advertising, you can get started today! But, if you’re feeling overwhelmed, don’t fret! Agent Branding System is a Yelp Ad Certified Agency, one of the first in the country. We can help you not only claim your page but also set-up your enhanced profile and create targeted ads that can help generate leads and grow your book of business. By working with a Yelp Ad Certified Agency, you can let us do the heavy lifting, while you concentrate on what you do best: leading your team in the hunt for new policies while working with your existing customers to ensure they are protected and covered in any eventuality. You’ll also realize there’s additional time to properly recruit, train and retain your team. Contact us now, and find out more! You can schedule a toll free call, at anytime, by calling 1-888-776-7761.